The surgeon is sterile while using Dexter. He or she can switch between robotics and laparoscopy in less than 20 seconds. Instead of replacing the laparoscopy by robotics, Dexter enhances the laparoscopy with the benefits of robotics. Dexter allows direct contact with the patient at any point in time and provides the access to the patient best suited for the task. The benefits of robotic-assisted surgery: precision, instrument dexterity and an ergonomic posture for the surgeon are provided, while keeping the simplicity of a laparoscopy. Quick setup, low footprint and a versatile concept limit the space Dexter requires and allow comprehensive access to the patient. Dexter allows the use of robotic surgery at the price of a laparoscopy. Why? 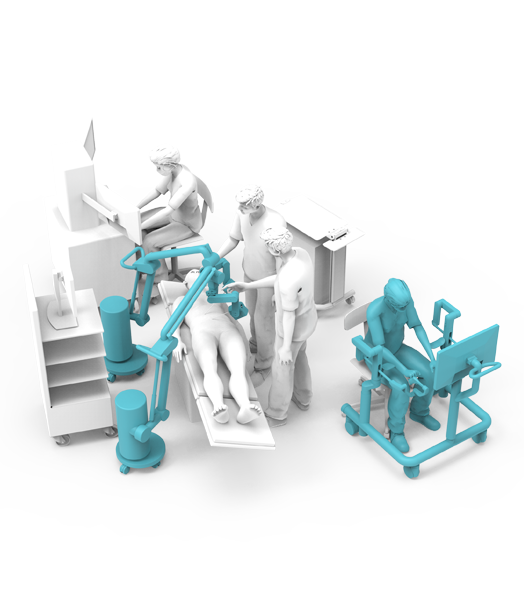 Instead of creating a complex robotic solution with up to five arms and a proprietary imaging system, Dexter is a lean, two-arm solution that augments the surgeon’s hands with the dexterity, precision and ergonomics – while maintaining the versatility of laparoscopy. Open platform for the use of standard laparoscopic instruments for vessel sealing, stapling and clipping as well as the use of the preferred imaging system. Replacing the two arms of the surgeon with instruments providing full dexterity	 Maintaining the laparoscopic setup and procedural workflow	 Sterile surgeon can switch between laparoscopy and Dexter in less than 20 seconds	 Using Dexter for dissection and suturing	 Open platform for the use of standard laparoscopic instruments for vessel sealing, stapling and clipping as well as the use of the preferred imaging system. Accessing the benefits of robotic surgery, natively integrated into laparoscopy. Dexter combines the benefits of both techniques in a versatile setup. By providing an open robotic surgery platform, there is full access to innovation in the area of visualization and energy outside of robotic surgery. Dexter eliminates the complexity of robotics by doing away with the long and cumbersome setup and breakdown of surgical robots. As the laparoscopic setup remains unchanged, the surgeon is beside the operating table, and communication with the team is easy. Ability to offer robotic surgery to patients without depleting OR budgets and limiting the ability to invest in innovation. Dexter provides the competitive advantage to all hospitals giving the best care to their patients. Patients are seeking the best possible care. Robotic surgery brings the latest technology into the operating room and Dexter combines robotic technology with the best of minimally invasive surgery.